NHPW is a time for your chapter to raise awareness about the problem of hazing, and educate others about preventing hazing. Risk prevention is a major concern of Greek organizations everywhere. Alpha Kappa Psi takes a firm stance against hazing, and your chapter’s compliance is key to meeting that goal. 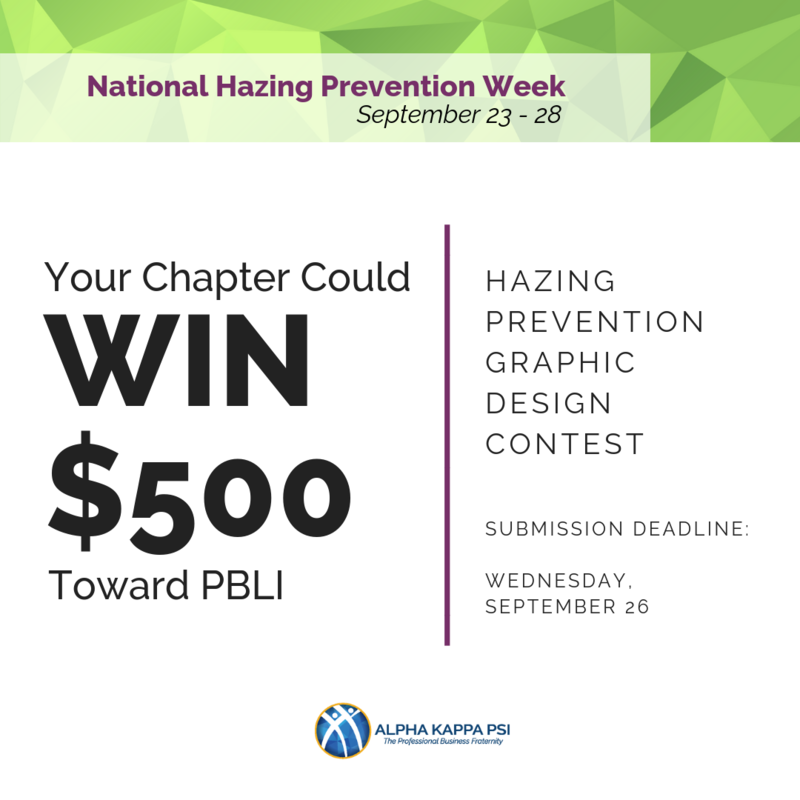 Show us how you stand up against hazing by designing a social media graphic focused on National Hazing Prevention Week. A winning graphic is enticing and evokes a sense of urgency for chapters to prevent hazing, and is visually balanced and cohesive. Graphics submitted by the deadline may also be featured on the AKPsi Facebook, Twitter, and Instagram accounts. Your chapter could win $500 toward any of the four 2019 PBLI events! Must include the new AKPsi logo. Graphics including the old logo will not be considered. Must include the words “National Hazing Prevention Week” in the graphic. No displays of violence are allowed. Use of any hand signs is prohibited. The winners will be chosen by a committee and announced by 11:59 PM Friday, September 28. Only collegiate chapters are eligible for this NHPW incentive. Alumni chapters are not eligible. All submissions must be received by 11:59 PM Wednesday, September 26, 2018 for consideration. All submissions are created and submitted on behalf of one collegiate chapter. Multiple submissions from the same chapter will not be considered. The funds will be issued as a credit on your account with the Heritage Center, thus allowing your chapter budget to have an excess of $500. The design must be created and submitted by a collegiate member of the chapter. Closed collegiate chapters are not eligible for this incentive. The funds must be used for PBLI purposes. If the winning chapter has not registered at least four chapter officers for PBLI and the Chapter Achievement Pathway Track (formerly Officer Training) by the early bird deadline, the monetary prize will be forfeited and the credit with the Heritage Center will be removed. These funds can cover registration fees, transportation, lodging, and meals. The swag bag is intended for chapter use and includes a flag, balloons, decals, and wristbands. Use these risk reduction resources to learn more ways to prevent hazing.